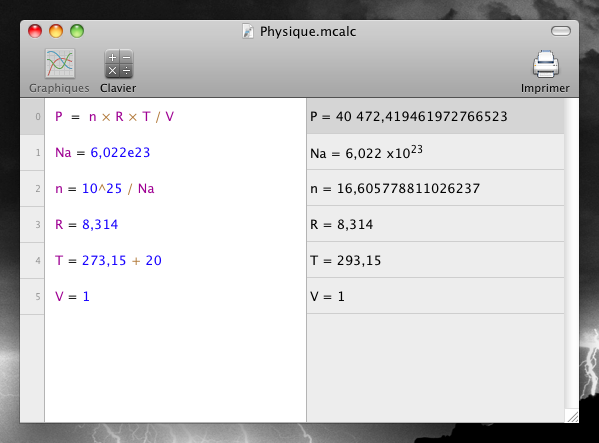 Magic Calculator starts instantly, then just type your calculation in natural notation and get results while keyboarding. Do you need to do some intermediate calculations ? Magic Calculator allows you to define as many calculation rows as you want. Add a row by pressing enter, it's as easy as a text editor. You can use the result of a calculation row with the @ symbol, followed by the number of the row. You can also define variables with a more meaningful name : variable's name = a calculation. If you change a row in a document, all rows that use its result are automatically updated. If you define a function of one variable, for example, by writing : f(x) = cos(x^2), Magic Calculator opens automatically a new window to visualize the graph of the function. By using mouse wheel, and drag&drop you can easily zoom and move the display. If you define more functions, this window will allow you to select which ones you want to display. Magic Calculator can handle many documents at the same time. You can save them to reuse them later. A lot of mathematics functions and constants are pre-defined. The supported functions are : int (next lowest integer value by rounding down), sqrt (square root), abs (absolute value), cos , sin , tan , acos , asin , atan , ln , log ; and constants are : e et pi. Mathematics operators : +, -, *, /, ^ (power). To write floating numbers you can use . (point) or , (comma) as decimal separator. 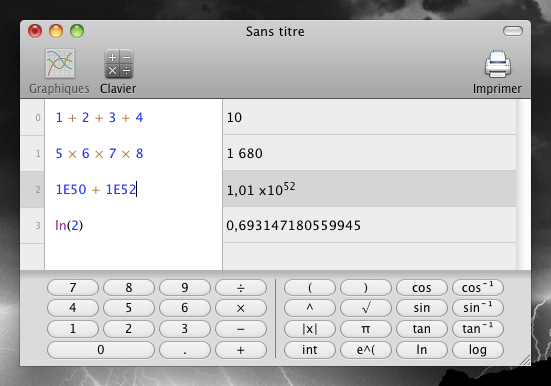 You can also use the E notation for power of 10 (example : 1.15E6 for 1.15*10^6 = 1 150 000). Magic Calculator is fully translated into English and in French.